Christmas decorating has started off on the wrong foot. Mike went into the attic today while I was out shopping to get all of the decorations. He pulled a Griswald. He misstepped in the attic and came through the ceiling. 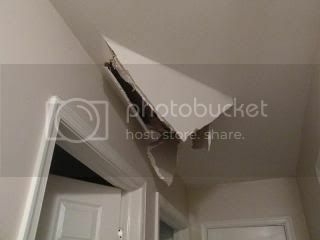 Thanfully, he didn’t fall completely through BUT I do have a big whole in my ceiling. He wasn’t hurt and didn’t have a scratch on him. I wish I could say the same for my ceiling. 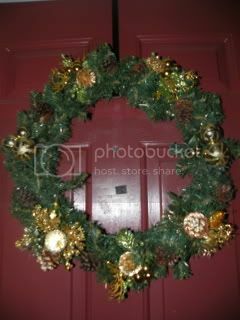 Next up was making a new wreath for the front door. 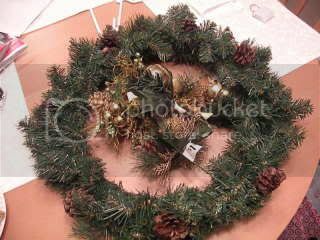 The one we had was very old and AC Moore was having a great sale on plain wreaths and holiday picks. Not too shabby if you ask me!